The United States is the world’s second largest trading nation. But while 68% of Americans say trade is good for the country, they hold starkly different views than people in other countries around the world when it comes to the supposed benefits of international commerce: job creation and higher wages. Only one-fifth of Americans believe that trade creates jobs compared to a median of 44% among people in advanced economies, 52% of those in emerging economies and 66% of those in developing countries, according to a new Pew Research Center 44 country global survey. The disparities are similar when Americans are asked if trade increases wages, with the U.S. public holding a far more negative view than people in most other nations. 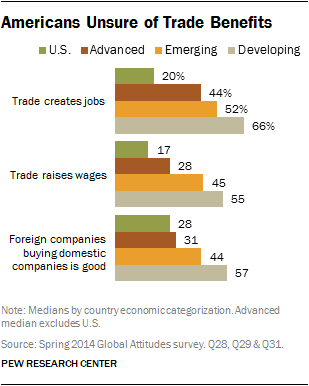 The U.S. public also has a dim view of the benefits of foreign companies buying domestic ones. Just 28% of Americans see this as a good thing. While that view is shared by a similar number of people in other advanced economies, it is significantly lower than in the emerging world (44%) and developing countries (57%). Looked at another way, 50% of Americans believe trade destroys jobs compared to a global median of 19% and 45% say it lowers wages compared to a global median of 21%. About two-thirds (67%) of Americans say foreign companies buying domestic companies is a bad thing compared to a global median of 46%. The public’s view about jobs is consistent with the priority Americans placed on the importance of protecting U.S. jobs as a long-range foreign policy goal. In a survey last November, the share of the public (81%) saying protection of American jobs was a foreign policy priority ranked almost as high at the time as those concerned about protecting the U.S. from terrorist attacks. There is not much difference between Democrats and Republicans in their views about the impact of trade. They both think its good for the country. But half or more in both political parties say it destroys jobs and a plurality say it lowers wages.